Social Networking sites have the potential to drive significant traffic to any blog, especially if the bloggers utilize effective social media marketing strategies. Social media actually includes human beings as the primary actors, thereby making it the most perfect platform to publicize and promote blogs and products amongst a large number of users globally. However, quality traffic can only be expected from these social networking sites if the bloggers regularly post blogs to their social media profiles. Below is the list of top 8 social media sites that you should not overlook and positively use it as an integral part of your social media marketing strategy. The advent of Facebook has not only revolutionized the way people and world communicate, connect and share videos, pictures, ideas, and news, but also made it easier and possible for enterprises and businesses to promote their services and products amongst the mass audience globally in a astounding win-win way. With more than billions of users, Facebook is the largest social networking site today. So, leverage your friends and regularly share blog posts with your fan base and Facebook users. Google+ is the biggest competitor of Facebook and other social networking sites. Besides social networking, it plays a crucial role for promoting blogs. Today, it is becoming quite important for bloggers to share their blog posts on Google+ because the social signals are now considered to rank the web pages. Moreover, Google also gives importance to the authors as well; therefore Google utilizes the data from the blogger’s profile on Google+. So, if the blogger is quite popular in this social media site, then their blog posts tend to rank higher automatically. This social network is the second most popular platform which is also called as a micro-blogging website. If the content is viral in nature, then the chance for getting massive traffic to websites or blogs through Twitter increases significantly in no time. LinkedIn is the highly preferred professional networking site having more than millions of active users. The quality of traffic is far better in LinkedIn compared to other social networking sites because this platform is largely used by professionals looking for business and job opportunities. Pinterest is another popular social media that has the potential to drive in more quality traffic compared to LinkedIn, YouTube and Google+. If the blogs comprise of some quality pictures and images, then Pinterest would be the best bet for the bloggers. They simply need to pin the images under the correct category in Pinterest and it will automatically direct traffic to you and your blogs constantly. Today, most of the bloggers overlook the potential of Tumblr without knowing the fact that this platform can create exceptional prospects to promote blogs. So, bloggers should positively include it in their social media marketing strategy for effective results. You will really appreciate the way blog posts are presented on your profile. It is really very cool and captivating compared to Facebook and Twitter. 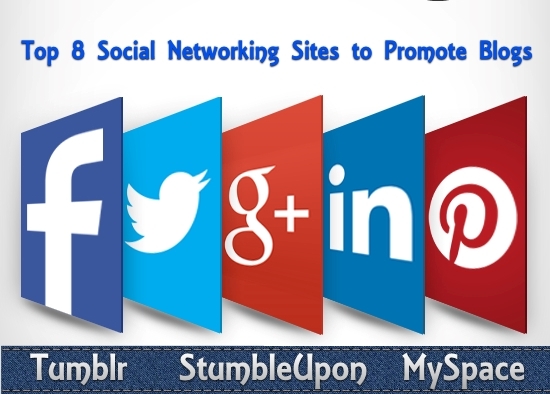 StumbleUpon is the most effective social bookmarking website. This platform is quite effective in sending quality traffic to your blog. This website takes less than 5 minutes to share blog posts amongst the users, thus making it easier for bloggers to get quality traffic instantly from StumbleUpon. Before the advent of Facebook, this platform was ruling the social networking world. But today lots of changes have been made in MySpace and millions of people across the globe still use this platform for socializing. So, bloggers may also promote their blog posts on MySpace where they can get healthy audience for their blogs. Conclusion – These were top 8 social networking sites which you may use to promote your blog posts. But, don’t just limit your campaign with Twitter and Facebook, instead you may try to use the entire potential of all popular social media sites to achieve success. I think Myspace is a ghost city, it will not drive traffic like StumbleUpon or Facebook. Good to see your thoughts here. BTW Myspace is good. We are getting good traffic from that. Pinterest is my first choice for sharing articles, because it gives the quality traffic. And also reddit is one of the best traffic source for bloggers. Tumblr is actually an old one. Yes it is good source to share content. I am hearing a lot about Pinterest and it is top 4th largest Traffic Referral.Google + is also great SEO wise. Working for me . I am getting more traffic from Facebook and I found Reddit is also one of the best traffic sources. Nice blog, i think every blogger love to use all the tips you mention in this post. I will try your suggestions and see how it goes.